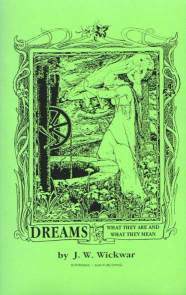 DREAMS: What They Are and What They Mean by J. W. Wickwar. Dreams: Through the Ages, Dreaming and Sleeping, The Dream: A Theory, Dreams: Their Cause and Make-Up, Day Dreams, Prophecies, etc., Reflection and Wireless, Psycho-Analysis, The Dream Complex, Custom, Superstition, and Belief. 126 pgs. 5x8. Paperback. ISBN: 0-89540-314-5. $10.00.